So. Autumn is here and what a better time to go through your closet, see what you like and what you’re not wearing anymore and more importantly – what you could give a new life to. And if your old clothes don’t inspire you any more trade with a friend. They don’t have to be the same size or even gender as you. You just have to get your hands on garments that will allow you to play a bit. Some fabric scraps, a few pieces of trim and new buttons can sometimes change a garment completely. With a little help from Sew Box and a bit of Liberty print Bias Binding and buttons, I turned a plain man’s shirt into a quirky blouse. You don’t need a lot of time for this refashion, just a bit of courage. First, chop of the collar. Then the sleeves. At first I wanted to use the front of the shirt as the back of my new blouse, but since I used a shirt that was already my size at the bust area and I didn’t have a lot of fabric to play with, I decided to keep the front as it was – I later changed the buttons. I drafted new arm openings. I used this liberty print bias tape for the cleavage, which was soft and a pleasure to work with. I then hemmed the arm openings and created pockets. The best way to get functional pockets is to make sure your hands fit in them. I created a pocket shape from scrap cardboard and then applied them to the garment. 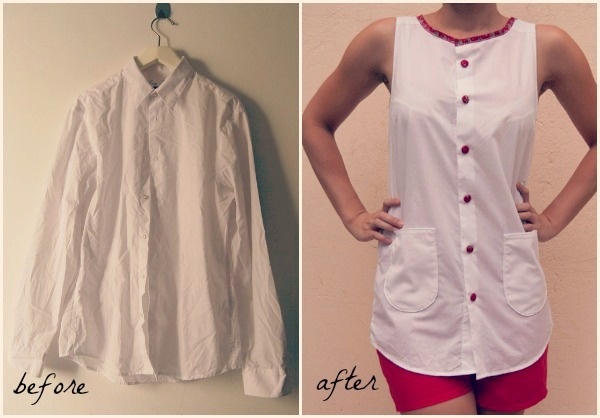 Hope you like my Rosie the Riveter inspired blouse and this refashion. Have a nice weekend and happy sewing!